Osteoporosis is a condition which is characterised by bones losing their strength which makes them more likely to break following even a minor bump or fall. The fractures which are caused by the weakened bones are commonly known as ‘fragility fractures’ and it is often only through suffering these fractures that the condition is diagnosed. It is a condition that is commonly found amongst older people but it can occur in the young. Around one in two women and one in five women aged 50 or over experience fractures as a result of their lowered bone strength and the most common sites for fragility fractures are the wrists, hips and spine. Other bones too can be fractured and in all instances it can be a very painful condition to live with and one which is managed mainly through the prevention of slips and falls and treatment to attempt to strengthen the bones. 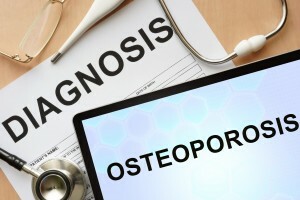 If your doctor believes you may have osteoporosis they will make an assessment using an online programme and then they should refer you for a scan to measure your bone mineral density. This type of scan is known as a DEXA scan and it is a short painless procedure which will give you a measure for your bone mineral density and from here your fracture risk can be assessed, giving you an answer to whether you have osteoporosis or not. As mentioned treatment for osteoporosis is mainly based on preventing fractures and using medication to strengthen bones, as well as treating fractures when they do happen. The decision about your treatment will be based on your risk of fracture and will also take into consideration your age, and the results of your DEXA scan. Self-help measures such as eating healthily and exercising can help reduce your risk of fractures but your doctor may also recommend specific treatments including calcium and vitamin D, bisphosphonates, teriparatide and parathyroid hormone, raloxifene, denosumab, hormone replacement therapy (HRT) and strontium ranelate. These are all options that your doctor may offer to you and may discuss with you as the best option for your condition and in every instance you should feel comfortable with the path of treatment chosen for you. The other element of treating osteoporosis is the management of fractures and they tend to be treated like any other kind of fracture with the need for a cast in many instances and monitoring of how the bone mends. If you have any questions regarding Osteoporosis please get in touch with Dr Stephanie Barrett.